I wish I could post about all of the cute projects and learning we did last week but...........I really have no idea what my kiddos did last week!!! GASP!!! Why you might ask???? Well I had JURY DUTY!! And despite my best efforts to fidget, look and the clock and explain that my kiddos certainly wouldn't be able to live without their teacher I was picked to serve on a jury for an actual trial!!!!! Obviously they have no idea how hard it is for a teacher to sit still and only pay attention to one thing at a time!! I was constantly reminding myself to pay attention to what was going on and not think about the other 100 things I could be doing! The case actually turned out to be pretty interesting and I was able to come home at night. However we had strict instructions not to blog or use other social media - GASP!!!!! I survived (barley)! Of course since I wasn't planning on being picked so I only prepped for 2 out of the 3 days ahead of time. I was planning to squeeze in all of the fun projects that I didn't want to leave for the sub on Friday....alas no such luck...instead I was scrambling to make plans for Friday. Luckily I have an AWESOME team who pitched in and made things so much easier. My kiddos survived too.....mostly.....as Friday was also our drill day so they had a fire drill, tornado drill and lock down drill with the sub!!! (I felt awful for her!) We did have a serious talk today about the expected behavior during said drills regardless of if I am there for them or not! So to make up for not having anything cute to share from last week I have linked up a Teen Number Math freebie below. 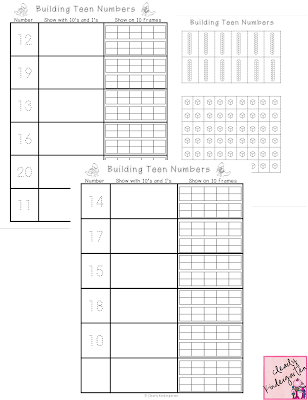 I am using it as a recording sheet in one of my math centers this week, but you can also use it on its own. In my math center the kids are picking a teen number card and then building the number with 10's rods and 1's cubes. Next they find the number on the sheet below and cut and paste the 10's rods and 1's cubes and make it on the ten frames. Click HERE to grab your free copy! I would love to hear your feedback if you download it! Hope everyone has a good week! Hopefully I will have pictures to share this week!!! Oh you poor thing!! I'm so sorry, that must have been very stressful. Believe me, I know sub plans like the back of my hand at this point, and they are seriously annoying. I'm not sure what I would do if I couldn't blog, eeeeek! Thanks so much for the amazing freebie :) you are so fab girl. Can't wait to use it with my littles! Ugh I know I was thinking of you as I was scrambling to get Friday's plans done! Glad you like the freebie! Hope the rest of your week is goes well! Congrats on being back! It was a lesson in patience for sure! Ugh...I hate that you had jury duty. It's so hard to be out of school. Thanks for the freebie...this is great! I can't believe you had jury duty!!! I guess it's that time of year! I was summoned to serve in March, but I am currently home on maternity leave and used my EBF son as an excuse not to serve (it would be next to impossible to serve with a baby eating every two hours, right?) well.. I know my time will come again! Thanks for the awesome math freebie! Oh my! I have jury duty on March 18th! I am super nervous about it!! I hope I don't get picked. 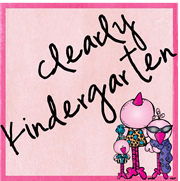 I teach a 1st grade class with a high concentration of students with IEP's, and they DO NOT like change! :( I have a really nice substitute on reserve but still, I hope I can just go there and not get picked!! I guess I should put together some really fun lessons for them like and pray that we don't have all those drills that your sub had. I was a sub for 6 years before teaching full time, so I KNOW how hard a day like that must have been for your sub! Anyway, love your blog! So bright and friendly! I am happy to be your newest follower! Thanks for the math freebie too! !